Accommodation in 4* hotels at all places. 03 NIGHTS - ROTORUA: - POLYNESIAN SPA, WHAKHARWAREWA THERMAL VILLAGE WITH HUKA FALLS, AGRODOME SHEEP SHOW, RAINBOW SPRINGS. Accommodation in 4* Hotels at all the places. Services of an experienced Indian tour Manager. GST, Visa, Tips (04NZD PER DAY PER PERSON). Optional tours and adventures activities. All expenses of personal nature like laundry charges, telephone charges, food and drinks not forming part of the group menu. Item not included in Tour Cost includes column. 2 Blank letter heads per VISA of the company duly signed, for visa purpose. 4 Photographs per visa – size 35 x 45 mm white background, matt finish with 80% face coverage without Spectacles. IN case honeymooners -- mother and father passport copy, wedding card copy, joint photographs, no objection letter of parents of both parties. FOR AUSTRALIA (If you are Transiting Australia) / NEW ZEALAND, ALL THE DOCUMENTS MUST BE DULY NOTARISED with LION Mark clearly visible and not TRUE COPY. 1. When is the best time to visit New Zealand? You can visit New Zealand at any time of the year. Summer and winter temperatures vary by only about 10ºC over most of the country, making New Zealand an ideal holiday destination all year round. In summer there's plenty of sunshine, and activities in and around the water include rafting, snorkelling, diving and kayaking. You'll find snow on the mountains in winter and excellent skiing. Away from the mountains, New Zealand winters are mild and temperatures generally do not fall below freezing. 2. What is the climate like? New Zealand's seasons are the reverse of the Northern Hemisphere. This means that the warmest months are December, January and February, while the coldest are in June, July and August. Don't let cold months put you off - winters tend to be short and generally fairly mild. 3. What is the major currency used? The New Zealand dollar is the currency used across the country. 4. What clothes should I take? Dress is informal and relaxed on most occasions. Smart casual clothes are acceptable at most restaurants and night-spots. Men are generally not expected to wear suits and ties, except in a few of the top formal bars and restaurants in major cities. 6. Which are the popular dishes in New Zealand? Some of the popular dishes in New Zealand are Pavlova. Pavlova is a much-loved desert in New Zealand made with meringue, whipped cream and fruit. Jaffas are a confectionery favourite. Jaffas are small sugar-coated chocolate balls with an orange flavour to them. Hokey Pokey is the most popular ice cream in New Zealand. Spaghetti on toast is one more popular dish. Lamingtons are a sponge cake, coated in raspberry or chocolate and then sprinkled with shaved coconut. It’s common to cut them in half and fill them with cream or jam, but in most cases it’s simply eaten as is. A very popular snack enjoyed during morning or afternoon tea. 7. Is tipping necessary? Restaurant workers do not work only for tips in New Zealand, so do not feel obliged to leave a tip when paying your check. If the service was excellent, leaving a 10% gratuity is more than generous and your waiter or waitress will certainly appreciate it.Tipping taxi drivers in New Zealand is not a common practice. 2. Do pay attention to the weather. 3. Do ask locals for help. 2. Don’t stand in the middle of the road to take pictures. 3. Don’t be disrespectful to Maoris or All Blacks. 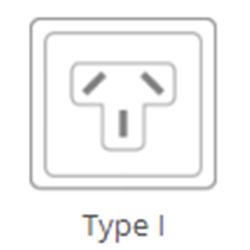 New Zealand uses 230V, 50Hz with socket and plug Type I.
Australia uses 230V, 50Hz with socket and plug Type I.